Every girl wants beautiful, strong , shiny nails. But due to fast life we don’t care them properly, here is some nail care tips. 1. Use scrubber on your nails once a week to make them shiny. 2. Massage your nails with olive oil for strong nails. 3. Rub Vaseline on nails after taking bath for nourishing cuticles and nails. 4. For soft nails make paste of honey and olive oil apply it on nails for 5 minutes, then wash it off with cold water. Repeat this tip thrice a week for best results. 5. For dry and brittle nails massage gently for five minutes with vitamin E oil or almond oil before going to bed. Follow this remedy daily for noticeable change. 6. For instant shiny nails clean your nails with toothpaste and soft toothbrush and then massage with baby oil . 7. For brighter and whiter nails soak your nails in lemon juice for 10 minutes or rub squeezed lemon on nails. 8. 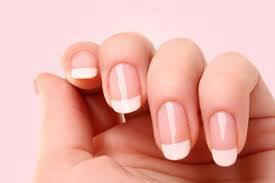 For stronger and healthier nails dissolve a tablespoon salt in warm water. Add few drops of olive oil and add a tablespoon lemon juice. Soak your nails for 15 minutes in thi solution, rinse with lukewarm water pat dry massage with almond oil. Repeat this tip two times per week for best results. 9. Soak your nails in lukewarm mustard oil for 5 to 10 minutes then rub each of them gently and slowly to ensure the circulation this tip will provide nourishment to your cuticles and makes your nails strong. 10. Soak your nails in warm milk for 10 minutes to strengthen and whiten your nails and grow them faster. Beside all these tips drink lots of water to keep your nails and cuticles hydrated. This entry was posted in Beauty, skin care and tagged beautiful hands, Beauty, beauty tips, manicure, Nail care, natural remedies, pedicure. Bookmark the permalink. 2 Responses to Home Remedies for Nail care. Reblogged this on Go Natural.